Our effort found its way into newsprint here in Asheville North Carolina — a cover story in the “Mountain Express” alternative weekly. 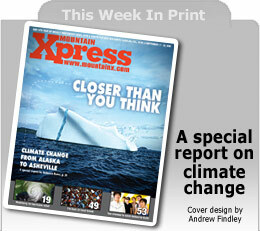 When Xpress caught up with Jones, he was preparing for a trip to Greenland to “watch the glaciers melt. There’s a group of European businesspeople who are very concerned about climate change,” he explained, though he wasn’t at liberty to identify the businesses. “The European heat wave several years ago was their Katrina.” (The 2003 heat wave, which logged some of Europe’s hottest summer temperatures ever, caused 35,000 deaths, according to the Earth Policy Institute, a Washington-based environmental think tank.) After touring some glaciers with the group, Jones planned to lead them in an exercise using a computer game designed to help people truly grasp the implications of climate change. “If we’re going to make decisions about long-term trends,” says Jones, “we have to get to the point where my grandmother could understand what we’re trying to say.” A few major corporations, including Nike and Citibank, have given the Sustainability Institute funding to help disseminate the simulator, notes Jones. Ultimately, he hopes the bathtub simulator can be used to prep delegates to the 15th Conference of the Parties to the U.N. Framework Convention on Climate Change, who will travel to Copenhagen in December 2009 to hash out an international agreement on curbing greenhouse-gas emissions. Such a treaty would replace the Kyoto Protocol, which expires in 2012.